I hope y'all had a fabulous weekend. There's something about opening up a fresh blog page that just feels so therapeutic to me! I absolutely love writing on Ashley's Passion for Fashion and bringing to y'all cute, affordable fashion that the every day girl can wear. If y'all follow me on Instagram (which it would make my day if you would, click HERE to follow me! ), I discussed my photo shoot I had last Monday with the oh so talented Savannah Seals (check out more of her work here) for a local store here in Chattanooga called Studio 6. It is seriously SUCH a cute boutique store with so many trendy yet affordable pieces. I wanted to share one of my favorite looks I wore during our shoot that is the perfect dress for a summer date night or girl's night out! I am convinced that every girl can wear a maxi dress! I love that it gives such a put together, glam look yet it's SO easy. Literally, one piece of clothing and you're good to go for the day (or night)! I LOVE the print on this dress! Paisley is so southern and classy. I also love the contrast of the dark navy dress with the light paisley print. It really makes the print pop! Not to mention that it's off-the-shoulder: one of my absolute favorite styles for a dress or top. 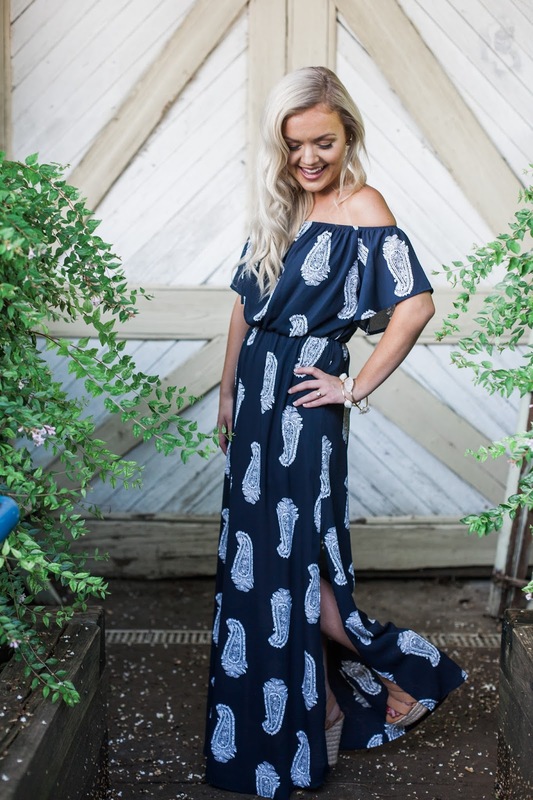 Anyone else love a maxi dress as much as I do? Leave me a comment so we can bond over our maxi love! Thanks so much for reading; I appreciate each and every one of you as always.